I disagree with your latter point Swissdiver. A BA gold member could fly as little as 4 short haul legs with BA and generate very little to them, so not all Gold’s are that valuable. While not going into the merits or otherwise of the lounge, as they’ve been covered earlier, this lounge is really BA’s One World Emerald Lounge. Which on anyone day will be full of pax travelling in J, Y+ & Y, holding membership in any OW alliance programme at Emerald level. Indeed FDOS, but I’m sure you know what I meant! While almost all will fly BA out of T5, I suspect what none of us know is the number of Emerald holders of IB, AA and other OW members that use this lounge. Going purely on it being a OWE lounge, I think it does a decent job. It’s a step up from the other lounges in T5. I’d echo Martyn’s comments in that it can get a little busy but I’d give this lounge my vote over the JFK F lounge any day of the week. I shall be flying to Johannesburg in January 2018 in First courtesy of a birthday present from my wife. She’ll be coming with me of course. So Concorde Room or First lounge? Gold card holder flying from T5 tomorrow after a break from travelling for several weeks. I see the new Plaza Premium lounge has opened in T5 which I can access for free with AMEX Platinum. Has anyone been? How does it compare to the BA F lounge? Shame its at the opposite end of the terminal from the First Wing.. Frankly, I don’t see how anyone could find The Concorde Room exciting. It is decidedly average compared to the CX lounge in T3 and, one imagines, the new QF lounge opening next week. At least as RFerguson has explained the F lounge is pretty good as a Gold Card holder lounge. It’s still rubbish compared to the VS lounge in my opinion but with the CX/QF options in T3, it is starting to look like the place to be! Clarify something for me please, Mr F.
What’s the difference between the F Lounge and First Wing? And by the “real First class Lounge”, do you mean the Concorde Room? Or has that been Cruzed out? I’m booked on BA 53 in F – where should I head? Incidentally, the T2 Star options for F are rather good, especially UA’s offering. As with the Kris lounge, the First annex is accessed by an unobtrusive private entry to one side of the main lounge desk. 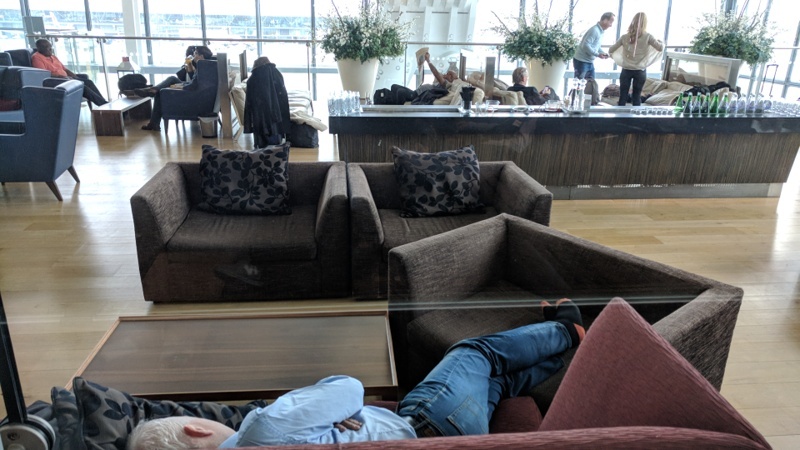 The T2 lounges of United, Singapore and Air Canada are pleasing, airy, spacious havens to compensate for that appalling long slog over to B gates. AC’s Maple Leaf Room even offers draught Guinness! So bugger BA’s mediocre champagnes. So I experienced the Plaza Premium lounge. Actually worked out well. I used the Fast Track security at the North End (no queues) and my flight left from a gate at that end. Very quiet with only about 10 people which was a lovely contrast to the scrum in all the BA lounges. Staff were proactive in offering me refreshments and very polite. Food choice more limited than BA F but for breakfast perfectly acceptable with a choice of hot and cold food. Washrooms immaculate. I quite like the booths which are not unlike a typical business class seat with individual tables, lights and power. I would highly recommend this option if you are flying from the North End of T5, or just want a break from BA lounges. Caveat is it is £40 for two hours unless you have AMEX Platinum (Priority Pass not yet accepted but will probably get busier once it is). It felt like a small exclusive club compared to the rat race at the other end! I’m generally very positive about the T5 F lounge, but this afternoon (Sunday 19th), it’s more or less completely full, with very few spare seats, passengers using the settees in the veranda as beds and lots of cases on seats with no one occupying them..
Monday morning this week around 0800 was the same. Hardly any seats and a scrum around the food areas. The First Wing was also the busiest I have experienced and of course everyone was then piling into the F lounge en masse. Given my positive experience of the Plaza Premium lounge 2 weeks ago, I regretted not making a second trip (especially as I then discovered my flight was leaving from a Gate at the North End). The Finnair Premium Lounge in Helsinki has real capacity issues at peak times. Whilst i’m not one for constant announcements in lounges I LOVE how they make periodic tannoys to ask guests ‘if they have any luggage on the seats to please remove it as the lounge is very busy’. I was there yesterday afternoon – it was packed. We then had the Finnair choir come in and sing Finlandia for the 100th anniversary. I guess by being full of passengers it might indicate that despite all the moans, BA are still attracting it’s fair share of passengers who fly First Class with them! Just a thought. I am with you FlightDoctor, I have lost my status on BA as I live and work in Asia, and on a recent visit to UK I was flying BA WTP without access to any BA lounge so I sucked up the cost of the Plaza Lounge and was very impressed with the level of food, it was quite so that was also a bonus and the pods you mention also excellent for catching up with work! I normally wouldn’t want to pay for a lounge but arrived early at T5 and check in and security were very quick and easy so had plenty of time to enjoy the facilities. Given that the F class passengers will use the Concorde Room, you might wish to reconsider.